Decorate your gifts with a few original flourishes and really impress your family and friends. Stack little gifts into a ribbon-tied pile to maximise their appeal. We used square-sided soaps, and simply wrapped each soap individually in contrasting wrapping paper, stacked them, and tied them together with organza ribbon. We bought nine pairs of earrings for less than £2. Yet presented in a pretty box, each pair looks worth so much more. 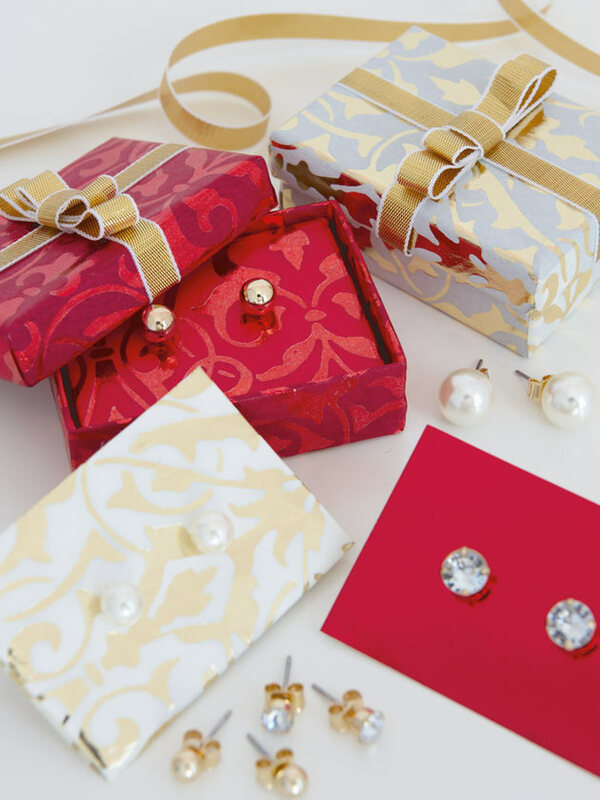 Cover boxes with bright wrapping paper to turn any small gift into a fabulous-looking present. Place your box on the wrong side of the wrapping paper and draw round the base with a pencil. Adding on twice the height of the sides to each side, mark out a second, larger rectangle around it and cut out. Extend the long sides of the base outline up to the outer rectangle, then snip down these lines to corner points of base. Place strips of double-sided tape round inner sides of box, just above base. Standing box on base outline, fold up the long edges of paper, trim corners to leave a small overlap, then smooth down inner sides and stick to tape. Fold over and stick short edges. Cover a box lid in the same way. Run ribbons across lid, sticking ends to inner sides. Pleat another piece of ribbon to form mock bows (see photo), wrap a short piece around it, gluing to hold, and stick on top. For earrings, cut a piece of card to fit box, cover with paper and make two holes with a darning needle or similar. 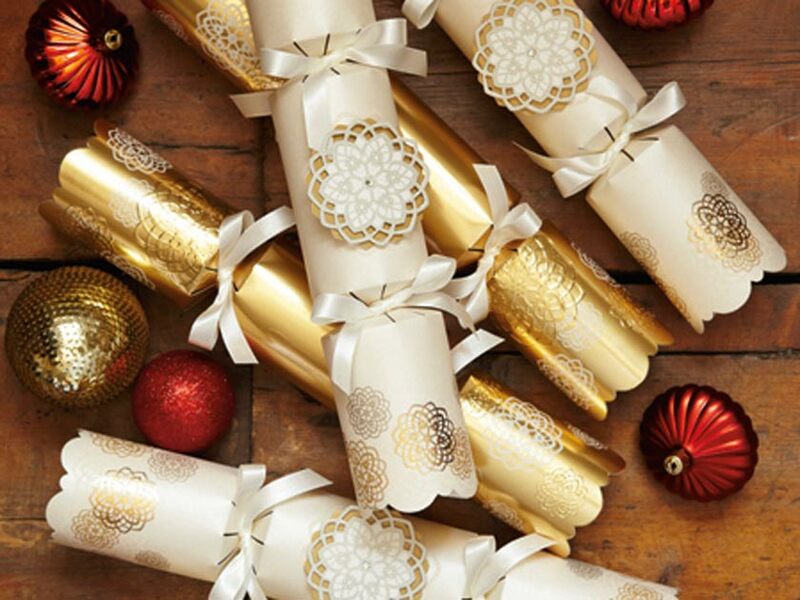 Take a cracker, carefully undo one end and slip your gift inside. This works best with smaller items. Hide an easy-to-guess gift, such as a CD or gift token, inside an old decorative tin. It will keep them guessing! Turn someone’s favourite sweets into a longer-lasting gift by popping them inside a Kilner jar, or perhaps a mug or a vase. 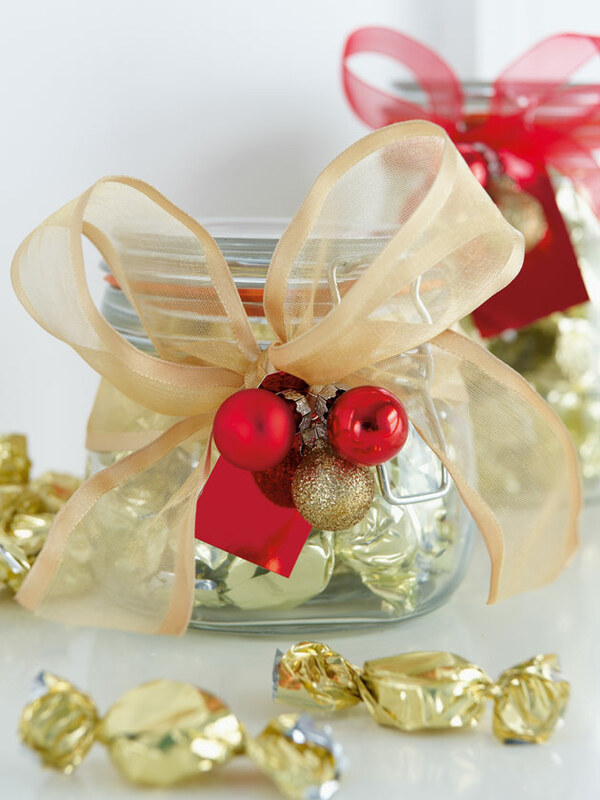 We packed jars with bright foil-wrapped toffees. To complete the gift, tie small baubles or beads to a gift tag, knot a pretty ribbon around the jar, thread on the tag, and tie ribbon into a bow.